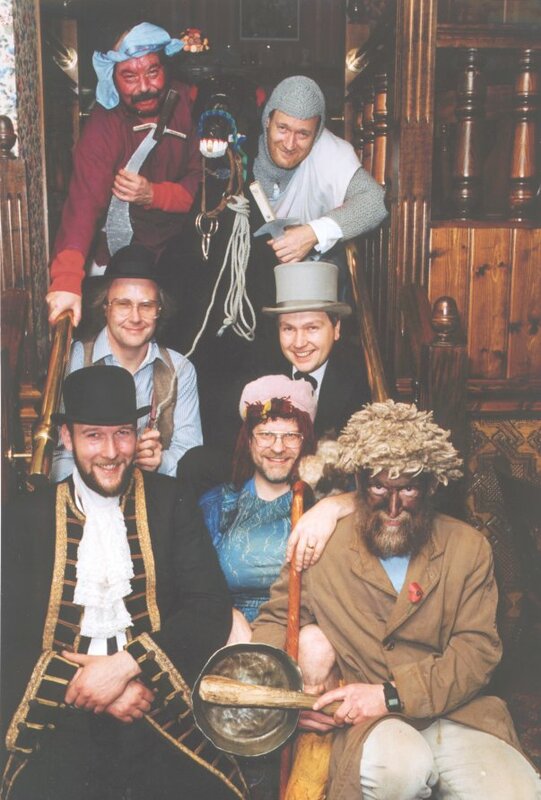 A group photograph of the players taken in the Saracens Head following the last performance of 1994. The credit for the revival of the play must be given to members of Bollin Morris who first performed the play in 1978. As well as their dancing interests the Morris side consisted of people with considerable affinity for the traditions of the land and especially those of a local nature, thus their interest in this play. The Morris side set up a group (with separate accounting) as the Bollin River Soulers and first performed the Alderley Edge Mumming Play during the winter of 1977/78 and followed this by performing the Warburton Souling Play in November 1978. Both plays were performed for a few years, however, in view of the many other commitments of the Morris side the Alderley Edge play was eventually dropped in favour of concentrating on the Warburton play. Over the years other people, either close to the Morris side, or as time went on totally unconnected, joined in the performance of the Play. Today the group is a combination of people with the common interest in wishing to keeping the Play alive. Some still dance with the Morris, some were members but are no longer active on that front, and others have become involved just to perform the Play. The 2001 season even saw the first father and son partnership, a combination still going strong today. As previously mentioned the revived Play was first performed in 1978 with the first performance on the 1st November at The Saracens Head. As per our interpretation at the time of the collected notes the Play went out on five nights at the beginning of November, in this case it was the 1st through to the 6th as the 5th was a Sunday and so was replaced by the following day, Monday the 6th. Today, with the harsh reality of getting the players out on five, sometimes consecutive nights, a decision was made in 1993 to follow the plan of other surviving or revived Cheshire plays and spread the 5 nights of performance over the first couple of weeks of November but always with the first performance being on the 1st November, unless it was a Sunday and in which case it's the 2nd.